Cape Cod is a cape jutting out into the Atlantic Ocean in the easternmost portion of the state of Massachusetts, in the Northeastern United States. Its historic, maritime character and ample beaches attract heavy tourism during the summer months. Cape Cod stretches from Provincetown in the northeast to Woods Hole in the southwest. Cape Cod encompasses Barnstable County, and is in full jurisdiction of the Cape Cod Commission, which includes a small part of that area that is on the mainland side of the Cape Cod Canal (which includes Buzzards Bay, Bournedale and Sagamore Beach. Most, however, incorrectly see the canal as Cape Cod's western boundary. Historically, the entire Town of Bourne (which was a part of Sandwich until 1884) was considered Cape Cod hundreds of years before the canal was built. 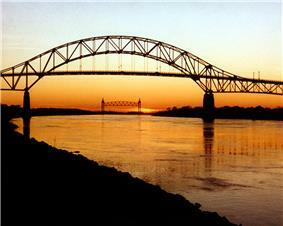 The Town of Sandwich also extends over the Cape Cod Canal onto the mainland side of Cape Cod. Like Cape Cod itself, the islands south of the Cape have evolved from whaling and trading areas to become resort destinations, attracting wealthy families, celebrities, and other tourists. These include the large nearby islands of Martha's Vineyard and Nantucket, which are themselves famous summer tourist destinations, commonly accessed by ferry from Cape Cod. 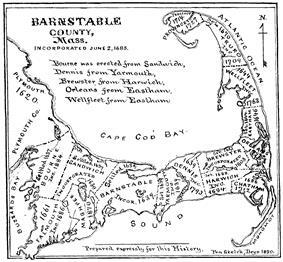 The phrases Cape Cod and the Islands and the Cape and Islands are often used to describe the whole region of Barnstable County, Dukes County (including the Vineyard and the smaller Elizabeth Islands), and Nantucket County. Cape Cod in particular is a popular retirement area, and the average age of residents is the highest of any area in New England. By voter registration numbers, Democrats outnumber Republicans by less in the three counties than in the whole of Massachusetts, to varying degrees. The name "Cape Cod", as it was first used in 1602, applied only to the very tip of the peninsula. It remained that way for 125 years, until the "Precinct of Cape Cod" was incorporated as the Town of Provincetown. No longer in "official" use over the ensuing decades, the name came to mean all of the land east of the Manomet and Scusset rivers – essentially along the line that became the Cape Cod Canal. Separating the vast majority of the peninsula from the mainland, the creation of the canal turned the resultant landmass into an island. Indeed, most agencies, including the Cape Cod Commission and the Federal Emergency Management Agency (FEMA), treat the Cape as an island with regards to disaster preparedness, groundwater management, and the like. 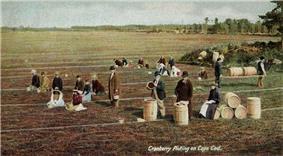 Most "Cape Codders" – residents of "The Cape" – refer to all land on the mainland side of the canal as "off-Cape." However, the legal delineation of Cape Cod, coincident to the boundaries of Barnstable County, extends to the northwest boundaries of the towns of Bourne and Sandwich – and small portions of each are located west of the canal. The elevation of Cape Cod ranges from 306 feet (93 m) at its highest point, at the top of Pine Hill, in the Bourne portion of Joint Base Cape Cod, down to sea level. Cape Cod and the Islands are part of a continuous archipelagic region consisting of a thin line of islands stretching west to include Long Island, in New York. This region is historically and collectively known by naturalists as the Outer Lands. 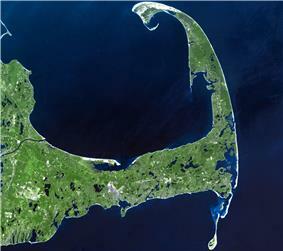 The Upper Cape is the part of Cape Cod closest to the mainland, comprising the towns of Martha's Vineyard. Falmouth is composed of several separate villages, including East Falmouth, Falmouth Village, Hatchville, North Falmouth, Teaticket, Waquoit, West Falmouth, and Woods Hole, as well as several smaller hamlets that are incorporated into their larger neighbors (e.g., Davisville, Hatchville, Falmouth Heights, Quissett, Sippewissett, and others). Bourne is home to the Massachusetts Maritime Academy, in the village of Buzzards Bay, along the canal, Joint Base Cape Cod, Aptucxet Trading Post, the annual Bourne Scallop Festival in September, and, until 1884, was part of Sandwich. Sandwich, the oldest town on Cape Cod, founded in 1637, is home to the Dexter Grist Mill, the historic Hoxie House, Heritage Museums and Gardens, the Sandwich Glass Museum, the Thornton Burgess Museum, the Green Briar Nature Center, a Friends' Meeting House, a U.S. Coast Guard Station, and many quaint inns and motels, restaurants, shops and activities. Mashpee, home of the Mashpee Wampanoag tribe of Native Americans, hosts Mashpee Commons, an outdoor shopping mall, with many boutiques, eateries, movie theaters, and offices, as is the newer South Cape Village, a short way south towards Falmouth, along Route 28; it is also home to New Seabury, an upscale residential golf community along Vineyard Sound, South Cape Beach, the Cape Cod Children's Museum, the Boys & Girls Club of Cape Cod, the Indian Meeting House just off Route 151, and a historic one-room school house near Town Hall, on Great Neck Road North. The Mid-Cape includes the towns of Barnstable, Yarmouth and Dennis. 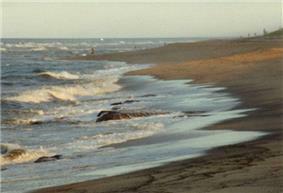 The Mid-Cape area features many beautiful beaches, including warm-water beaches along Nantucket Sound, e.g., Kalmus Beach in Hyannis, which gets its name from one of the inventors of Technicolor, Herbert Kalmus. This popular windsurfing destination was bequeathed to the town of Barnstable by Dr. Kalmus on condition that it not be developed, possibly one of the first instances of open-space preservation in the US. The Mid-Cape is also the commercial and industrial center of the region. There are seven villages in Barnstable, including Barnstable Village, Centerville, Cotuit, Hyannis, Marstons Mills, Osterville, and West Barnstable, as well as several smaller hamlets that are incorporated into their larger neighbors (e.g. Craigville, Cummaquid, Hyannis Port, Santuit, Wianno, and others). The villages of Yarmouth are South Yarmouth, West Yarmouth and Yarmouth Port. There are five villages in Dennis, including North Dennis, East Dennis, West Dennis, Dennis Port, and South Dennis. The Lower Cape & Outer Cape traditionally includes all of the rest of the Cape, or the towns of Harwich, Brewster, Chatham, Orleans, Eastham, Wellfleet, Truro, and Provincetown. In the present day, the five outermost towns (Provincetown, Truro, Wellfleet, Eastham and Orleans) are more commonly and collectively known as the "Outer Cape". 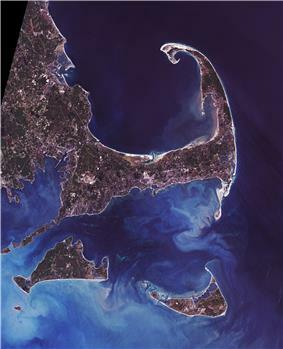 This area is home to the Cape Cod National Seashore, a national park that encompasses much of the Outer Cape, including the entire east-facing coast from Orleans to Provincetown. The Outer Cape is home to some of the most popular beaches in the United States, such as Nauset Light Beach and Coast Guard Beach in Eastham, Race Point Beach in Provincetown, Ballston Beach in Truro, and Skaket Beach in Orleans. The Outer Cape and the beaches in the area have become infamous for their summertime Great White Shark sightings along with numerous other shark species. In the summer of 2012, a tourist was attacked and bitten by a Great White Shark off of Ballston Beach in Truro, and had to be transported to a Boston-area hospital for treatment. He received almost 60 stitches in his leg and had surgery to repair damage. Stephen Leatherman, aka "Dr. Beach", named Coast Guard Beach the 5th best beach in America in 2007. The Outer Cape is the most unpopulated, or "rural" area of Cape Cod outside of Provincetown, which has a small, populated, city-like atmosphere during the summer season. Provincetown has become a major gay & lesbian resort destination – the town is regarded as one of the largest LGBT resort communities in the United States. Provincetown is also renowned for its historic fishing fleets and Stellwagen Bank, a popular fishing ground and whale watching destination, is located a few miles north of Race Point. Although Cape Cod's weather is typically more moderate than inland locations, there have been occasions where Cape Cod has dealt with the brunt of extreme weather situations (such as the Blizzard of 2005 and Hurricane Bob). Because of the influence of the Atlantic Ocean, temperatures are typically a few degrees cooler in the summer and a few degrees warmer in the winter. A common misconception is that the climate is influenced largely by the warm Gulf Stream current; however, that current turns eastward off the coast of Virginia, and the waters off the Cape are more influenced by the cold Canadian Labrador Current. As a result, the ocean temperature rarely gets above 65 °F (18 °C), except along the shallow west coast of the Upper Cape and along the southern coast (Nantucket Sound), where water temperatures can sometimes reach 70 °F (21 °C) or higher. Cape Cod's climate is also notorious for a delayed spring season, being surrounded by an ocean which is still cold from the winter; however, it is also known for an exceptionally mild fall season (Indian summer), thanks to the ocean remaining warm from the summer. The highest temperature ever recorded on Cape Cod was 104 °F (40 °C) in Provincetown, and the lowest temperature ever was −12 °F (−24 °C) in Barnstable. The water surrounding Cape Cod moderates winter temperatures nearly enough to extend the humid subtropical climate zone to what could be its northernmost limit in eastern North America, as the majority of Cape Cod is in USDA hardiness zone 7a. Consequently, many subtropical indicator plant species typically found in more southerly latitudes grow there, including Camellias, Ilex opaca, Magnolia grandiflora and Albizia julibrissin. However, Cape Cod falls below the 72 °F (22 °C) threshold, as the warmest month, July, averages around 68.25 °F (20.14 °C). Therefore, the climate may be better characterized as either a maritime climate or a humid continental climate (particularly on the northern coast of the upper and mid cape, which is somewhat sheltered from the cooler onshore wind to the south). Precipitation on Cape Cod and the islands of Martha's Vineyard and Nantucket is the lowest in the New England region, averaging slightly less than 40 inches (100 cm) a year (most parts of New England average 42 to 46 inches (110 to 120 cm)). This is due to storm systems which move across western areas, building up in mountainous regions, and dissipating before reaching the coast where the land has leveled out. The region does not experience a greater number of sunny days, however, as the number of cloudy days is the same as inland locales, in addition to increased fog. On average, 24 inches (61 cm) of snow, which is 18 inches (46 cm) less than Boston, falls in an average winter. Once every five or six years, a tropical storm, accompanied by very high and potentially damaging winds and heavy rain, will strike the region. About once every 11 or 12 years a hurricane brings damaging winds and storm surges to the region. Several Category 3 storms have struck Cape Cod since record-keeping began, such as the Long Island Express of 1938 and the 1944 Great Atlantic hurricane. Strong Category 2 storms, such as Hurricane Carol of 1954 and Hurricane Bob of 1991 also caused considerable damage. Notable Category 1 storms include Hurricane Edna of 1954 (shortly following Hurricane Carol) and Hurricane Donna of 1960, also Hurricane Irene in 2011, and Hurricane Sandy in 2012. Other notable storms include the Gale of 1815, which would likely have been rated a strong hurricane on the Saffir-Simpson scale, and the so-called "Perfect Storm" of October 31, 1991. The February 2013 nor'easter produced winds in excess of 80 miles per hour (130 km/h) and dropped over 24 inches (61 cm) of snow on some parts of Cape Cod. The storm knocked out power to tens of thousands of Cape Cod residents, some for up to two weeks. Cape Cod has been the home of the Wampanoag tribe of Native American people for many centuries. They survived off the sea and were accomplished farmers. They understood the principles of sustainable forest management, and were known to light controlled fires to keep the underbrush in check. They helped the Pilgrims, who arrived in the fall of 1620, survive at their new Plymouth Colony. In 1974, the Mashpee Wampanoag Tribal Council was formed to articulate the concerns of those with Native American ancestry. They petitioned the federal government in 1975 and again in 1990 for official recognition of the Mashpee Wampanoag as a tribe. In May 2007, the Wampanoag tribe was federally recognized as a tribe. Cape Cod was a landmark for early explorers. It may have been the "Promontory of Vinland" mentioned by the Norse voyagers (985–1025). The Manomet River area (taken up by the western end of the Cape Cod Canal in the early 20th century) is claimed by some to have been visited by Leif Eiriksson, and a stone wall discovered in Provincetown in 1805 is also claimed to have been built by his younger brother Thorvald Eiriksson around 1007 AD, when according to Norse sagas, the keel of his ship was repaired in the harbor. He was killed later in the same journey, and is said to have been returned to this spot for burial. However, there is no tangible support of the presence of Norse voyagers in Cape Cod, and the view is not generally accepted by archaeologists or historians. Giovanni da Verrazzano in 1524 approached it from the south. He named Martha's Vineyard Claudia, after Claude of France, the wife of Francis I of France. In 1525, Portuguese explorer Estêvão Gomes, sailing under the Spanish crown, called it Cabo de la Arenas. In 1602 Bartholomew Gosnold named the tip Cape Cod, the surviving term and the ninth oldest English place-name in the U.S. Samuel de Champlain charted its sand-silted harbors in 1606, and Henry Hudson landed there in 1609. Captain John Smith noted it on his map of 1614, and at last the Pilgrims entered the "Cape Harbor" and – contrary to the popular myth of Plymouth Rock – made their first landing near present-day Provincetown on November 11, 1620. Nearby, in what is now Eastham, they had their first encounter with Native Americans. Cape Cod was among the first places settled by the English in North America. Aside from Barnstable (1639), Sandwich (1637) and Yarmouth (1639), the Cape's fifteen towns developed slowly. The final town to be established on the Cape was Bourne in 1884, breaking off from Sandwich. Provincetown was a group of huts until the 18th century. A channel from Massachusetts Bay to Buzzards Bay is shown on Southack's map of 1717. The present Cape Cod Canal was slowly developed from 1870 to 1914. The federal government purchased it in 1928. Because of early colonial settlement and intensive land use, by the time Henry Thoreau saw Cape Cod during his four visits over 1849 to 1857, its vegetation was depauperate and trees were scarce. As the settlers heated by fires, and it took 10 to 20 cords (40 to 80 m³) of wood to heat a home, they cleared most of Cape Cod of timber early on. They planted familiar crops, but these were unsuited to Cape Cod's thin, glacially derived soils. For instance, much of Eastham was planted to wheat. The settlers practiced burning of woodlands to release nutrients into the soil. Improper and intensive farming led to erosion and the loss of topsoil. Farmers grazed their cattle on the grassy dunes of coastal Massachusetts, only to watch "in horror as the denuded sands 'walked' over richer lands, burying cultivated fields and fences." 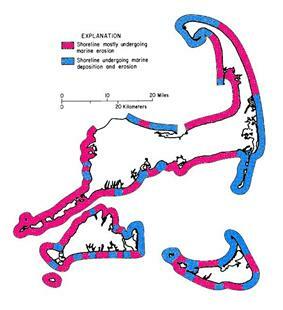 Dunes on the outer Cape became more common, and many harbors filled in with eroded soils. By 1800, much of Cape Cod's firewood had to be transported by boat from Maine. The paucity of vegetation was worsened by the raising of merino sheep that reached its peak in New England around 1840. The early industrial revolution, which occurred through much of Massachusetts and Rhode Island, mostly bypassed Cape Cod due to a lack of significant water power in the area. As a result, and also because of its geographic position, the Cape developed as a large fishing and whaling center. After 1860 and the opening of the American West, farmers abandoned agriculture on the Cape. By 1950 forests had recovered to an extent not seen since the 18th century. Guglielmo Marconi made the first transatlantic wireless transmission originating in the United States from Cape Cod, at Wellfleet. The beach below the bluffs where his station was located is now called Marconi Beach. In 1914 he began construction of a new transatlantic wireless receiver station in Chatham and a companion transmitter station in Marion. In 1920 the stations were acquired by RCA, and in 1921 Chatham began operations as a maritime radio station communicating to ships at sea using the callsign WCC. WCC supported the communications of Amelia Earhart, Howard Hughes, Admiral Byrd, and the Hindenburg. Marconi chose Chatham due to its vantage point on the Atlantic Ocean, surrounded on three sides by water. Walter Cronkite narrated a 17-minute documentary in 2005 about the history of the Chatham Station. The Kennedy Compound in Hyannis Port was President Kennedy's summer White House during his presidency, and the Kennedy family continues to maintain residences on the compound. President Grover Cleveland maintained a summer home in the Gray Gables section of Bourne. Other notable residents of Cape Cod have included actress Julie Harris, US Supreme Court justice Louis Brandeis, figure skater Todd Eldredge, composer and radio personality Canary Burton, and novelists Norman Mailer and Kurt Vonnegut. Influential natives included the patriot James Otis, historian and writer Mercy Otis Warren, jurist Lemuel Shaw, and naval officer John Percival. Due to its dangerously hidden and constantly moving shoals located just off-shore, Cape Cod's coastline from Chatham to Provincetown – a mere fifty-mile stretch of sea – has been called an "ocean graveyard", containing over 3,000 shipwrecks. Indeed, between Truro and Wellfleet alone, there have been more than 1,000 wrecks, including that of the Whydah Gally, the famed pirate ship of Samuel Bellamy that went down with over 4.5 short tons (4.1 metric tons) of treasure. Beginning in 1857, lighthouses were erected to serve as beacons to warn ships of the danger. Highland Light (or Cape Cod Light) is the oldest and tallest of these, and remains as one of a number of working lighthouses on Cape Cod and the Islands. Many of Cape Cod's earliest lighthouses featured a light tower that was attached directly to – and centered on the roof of – the keeper's dwelling. A stairway to the lantern room was accessible only from the top floor of the house. This came to be known as a Cape Cod style lighthouse, yet today, the only fully intact specimens are on the West Coast. Most of Cape Cod's lighthouses are operated by the U.S. Coast Guard with some exceptions such as the Nauset Light, which was decommissioned in 1996 and is now maintained by the Nauset Light Preservation Society under the auspices of Cape Cod National Seashore. These lighthouses are frequently photographed symbols of Cape Cod. In 1996, both the Highland Light and Nauset Light were moved, because they were each at risk of being lost to the encroaching seas. The Highland Light, then 110 ft (34 m) from the ocean, was moved 450 ft (140 m) to the west, and the Nauset Light, a mere 37 ft (11 m) from the ocean, was moved 300 ft (91 m) west. CapeFLYER is a seasonal passenger rail service between Boston and Hyannis that operates on summer weekends from Memorial Day through Columbus Day, beginning in 2013. Regular passenger rail service through Cape Cod ended in June 1959. In 1978, the tracks east of South Dennis were abandoned and replaced with the Cape Cod Rail Trail. Another bike path, the Shining Sea Bikeway, was built over abandoned tracks between Woods Hole and Falmouth in 1975, and in 2008 the 7.4-mile long (11.9 km) rail line between Falmouth and North Falmouth was removed and the right-of-way converted into an extension of the Shining Sea Bikeway. Active freight service remains in the Upper Cape area in Sandwich and in Bourne, largely due to a trash transfer station located at Joint Base Cape Cod along the Bourne-Falmouth rail line. In 1986, Amtrak operated a seasonal service in the summer from New York City to Hyannis called the Cape Codder. From 1988, Amtrak and the Massachusetts Department of Transportation increased service to a daily frequency, until service ended in 1996. The Cape Cod Central Railroad is a heritage railroad on Cape Cod. The service is primarily tourist-oriented and includes a dinner train over a scenic route between downtown Hyannis and the Cape Cod Canal lasting about 2½ hours round trip. The Massachusetts Coastal Railroad is planning to return passenger railroad services to the Bourne-Falmouth rail line in the future. Although Cape Cod has a year-round population of about 220,000, it experiences a tourist season each summer, the beginning and end of which can be roughly approximated as Memorial Day and Labor Day, respectively. Many businesses specifically target summer visitors, although the "on season" has been expanding somewhat in recent years due to Indian Summer, reduced lodging rates, and the number of people visiting the Cape after Labor Day who either have no school-age children, and the elderly, reducing the true "off season" to six or seven months. In the late 20th century, tourists and owners of second homes began visiting the Cape more and more in the spring and fall, softening the definition of the high season and expanding it somewhat (see above). Some particularly well-known Cape products and industries include cranberries, shellfish (particularly oysters and clams) and lobstering. Provincetown, at the tip of Cape Cod, also berths the original East Coast whale watching fleet (Dolphin Fleet) who patrol the Stellwagen Bank National Marine Sanctuary. The fleet guarantee a whale sighting (mostly humpback whale, fin whale, minke whale, sei whale, and the critically endangered North Atlantic right whale), and is the only federally certified operation qualified to rescue whales. Provincetown has also long been known as an art colony, attracting writers and artists. The town is home to the Cape's most attended art museum, the Provincetown Art Association and Museum. Each summer the Naukabout Music Festival is held at the Barnstable County Fair Grounds located in East Falmouth, typically during the first weekend of August. The festival features local, regional and national talent, along with food, arts and family-friendly activities. The Cape has nine amateur baseball franchises playing within Barnstable County in the Cape Cod Baseball League. The Wareham Gatemen also play in the Cape Cod Baseball League in nearby Wareham in Plymouth County. The league originated 1923, although intertown competition traces to 1866. Teams in the league are the Bourne Braves, Brewster Whitecaps, Chatham Anglers (formerly the Chatham Athletics), Cotuit Kettleers, Falmouth Commodores, Harwich Mariners, Hyannis Harbor Hawks (formerly the Hyannis Mets), Orleans Firebirds (formerly the Orleans Cardinals), Wareham Gatemen and the Yarmouth–Dennis Red Sox. Pro ball scouts frequent the games in the summer, looking for stars of the future. Along with the Cape Cod Baseball League and the new Junior Hockey League team, the Cape Cod Cubs, many high school players are being seriously recruited as well. Barnstable and Harwich have each sent multiple players to Division 1 colleges for baseball. Harwich has also won three state titles since 1996 (1996, 2006, 2007). Bourne and Sandwich, rivals in hockey, have each won state championships recently, Bourne in 2004 and Sandwich in 2007. Nauset, Barnstable, and Martha's Vineyard are also state hockey powerhouses. Barnstable and Falmouth hold the title of having one of the longest Thanksgiving football rivalries in the country. The teams have played each other every year on Thanksgiving since 1895. High school football teams on the Cape have also recently become successful and the region has also become a hot-spot for college recruiting. In 2011, four high school football teams from the Cape won state championships in their respective divisions; Dennis-Yarmouth (Division 2A), Bourne (Division 3A), Mashpee (Division 4), and Nantucket (Division 5). Also, numerous other Cape schools have made appearances in the football state championship game recently, including Barnstable in 2012, Martha's Vineyard in 2008, Cape Cod Tech in 2006, and Dennis-Yarmouth in 2013. The Bourne and Barnstable girl's volleyball teams are two of the best teams in the state and Barnstable is considered one of the best programs in the country. Bourne won the state title in 2003 and 2007, and Barnstable has won 12 Division 1 state titles in the past 13 years and has won the state title the three years in a row (2011–2013). In the 2010 cross country season, Sturgis Charter Public School's Division 4 cross country team remained virtually unbeaten throughout their running season. The end of each summer is marked with the running of the Falmouth Road Race, held on the third Saturday in August. It draws about 10,000 runners to the Cape and showcases the finest runners in the world (mainly for the large purse that the race is able to offer). The race is 7.2 miles (11.6 km) long, which is a non-standard distance. The reason for the unusual distance is that the man who thought the race up (Tommy Leonard) was a bartender who wanted a race along the coast from one bar (The Cap'n Kidd in Woods Hole) to another (The Brothers Four in Falmouth Heights). While the bar in Falmouth Heights is now the British Beer Company, the race still starts at the front door of the Cap'n Kidd in Woods Hole and now finishes at the beach in Falmouth Heights. Prior to the Falmouth race is an annual 5-mile (8.0 km) race through Brewster called the Brew Run, held early in August. Each town usually consists of a few elementary schools, one or two middle schools and one large public high school that serves the entire town. Exceptions to this include Dennis-Yarmouth Regional High School located in Yarmouth, which serves the two towns in its name, Monomoy Regional High School in Harwich, and Nauset Regional High School in Eastham, which serves the towns of Brewster, Orleans, Eastham, Wellfleet, Truro, and Provincetown (optional). Bourne High School is the public school for students residing in the town of Bourne, which is gathered from villages in Bourne, including Sagamore, Sagamore Beach, and Buzzards Bay. Barnstable High School is the largest high school and is known for its girls' volleyball team which have been state champions a total of 12 times. Barnstable High School also boasts one of the country's best high school drama clubs which were awarded a contract by Warner Bros. to create a documentary in webisode format based on their production of The Wizard of Oz. Sturgis Charter Public School is a public school in Hyannis which was featured in Newsweek magazine's "Best High Schools" ranking. It ranked 28th in the country and 1st in the state of Massachusetts in the 2009 edition and ranked 43rd and 55th in the 2008 and 2007 edition, respectively. Sturgis offers the International Baccalaureate Diploma Programme in their junior and senior year and is open to students from as far as Plymouth. The Cape also contains two vocational high schools. One is the Cape Cod Regional Technical High School in Harwich, and the other is Upper Cape Cod Regional Technical High School in Bourne. In 1976 the Cape schools and districts petitioned the Massachusetts Legislature to create an educational collaborative, the Cape Cod Collaborative, to facilitate cooperation and efficiency in providing gifted and talented, and special needs programs. With locations in Osterville and Bourne the Cape Cod Collaborative provides transportation services, professional development, autism support, developmental training, itinerant services and an alternative education program. Each summer, in cooperation with the Massachusetts Maritime Academy, it operates a gifted and talented science based program for students from around the Cape. In addition to public schools, Cape Cod has a wide range of private schools. The town of Barnstable has Trinity Christian Academy, Cape Cod Academy, St. Francis Xavier Preparatory School, and Pope John Paul II High School. Bourne offers the Waldorf School of Cape Cod, Orleans offers the Lighthouse Charter School for elementary and middle school students, and Falmouth offers Falmouth Academy. Riverview School is located in East Sandwich and is a special co-ed boarding school which serves students as old as 22 who have learning disabilities. Another specialized school is the Penikese Island School, located in the Elizabeth Islands off southwestern Cape Cod, which serves struggling and troubled teenage boys. Cape Cod contains two institutions of higher education. One is the Cape Cod Community College located in West Barnstable. The other is Massachusetts Maritime Academy in the village of Buzzards Bay. Massachusetts Maritime Academy is the oldest continuously operating maritime college in the United States. The virtues of Cape Cod are extolled in the song Old Cape Cod. ^ "The Cape Cod Commission Act". ^ The Cape Cod Canal Chamber of Commerce includes Wareham, Bourne, and Sandwich. ^ Vuilleumier, Marion R. (2003). Sagamore Beach. Arcadia Publishing. p. 7. ^ Cape Cod Commission. "Comprehensive Economic Development Strategy (CEDS)". Retrieved May 17, 2020. ^ a b "Forms of Municipal Government for each community in Massachusetts" (PDF). Massachusetts Municipal Association. July 2011. Retrieved 6 May 2013. ^ "Dates of Incorporation and/or Establishing City Form of Government" (PDF). Massachusetts Department of Housing and Community Development. 13 November 2008. Retrieved 6 May 2013. ^ Falmouth Chamber of Commerce (Retrieved December 21, 2006). Falmouth: A Pleasing Octet of Villages. Press kit. ^ Aptucxet Trading Post, Bourne Historical Society, Bourne, Cape Cod, MA. Bournehistoricalsociety.org. ^ Leatherman, Stephen. "DrBeach.org – America's Best Beaches 2007". Dr.Beach.Org. Archived from the original on May 18, 2007. Retrieved June 11, 2007. ^ Brigham, Sc.D, Albert Perry (1920). Cape Cod and the Old Colony. New York: G.P. Putnam's Sons. p. 132. ^ "Provincetown Spit, Cape Cod, Massachusetts". ^ Historical Weather for Provincetown, Massachusetts, United States of America – Travel, Vacation, Forecast and Reference Information. Weatherbase. ^ Historical Weather for Yarmouth, Massachusetts, United States of America – Travel, Vacation, Forecast and Reference Information. Weatherbase. ^ National Arboretum – USDA Plant Hardiness Zone Map. Usna.usda.gov (January 24, 2012). ^ Stephanie Vosk (May 25, 2007). "Wampanoag tribe wins recognition". Cape Cod Times. Retrieved June 5, 2007. ^ "Aptucxet Trading Post, Bourne Historical Society, Bourne, Cape Cod, MA". Bourne Historical Society. Retrieved Feb 27, 2011. ^ Tager, Jack and Jennifer L. Herman (2008). Massachusetts Encyclopedia. North American Book Dist LLC. p. 280. ^ Bailey, Anthony (1999). The Coast of Summer: Sailing New England Waters from Shelter Island to Cape Cod. Sheridan House, Inc. p. 154. ^ Stockwell, Mary (2006). A Journey Through Maine. Gibbs Smith. p. 48. ^ David J. Weber (1992). The Spanish frontier in North America. Yale University Press. p. 36. ^ "Shipwrecks – Cape Cod National Seashore". ^ "Lighthouse Moves – Cape Cod National Seashore". ^ Kolleth, Michael (May 29, 1988). "Daily Rail Service to Cape is Returning". ^ Ken Schultz's Fishing Encyclopedia, Wiley, 2000. Gofishn.com. Freeman, Frederick. (1860). The History of Cape Cod: The Annals of Barnstable County and of Its Several Towns (Vol. 1). Harvard University. Free e-Book in Public Domain. Freeman, Frederick. (1862). The History of Cape Cod: The Annals of Barnstable County and of Its Several Towns (Vol. 2). Harvard University. Free e-Book in Public Domain.